When considering the wonderful contributions that Russia has made to the culinary world, the first response that might spring to the mind of a typical Westerner is vodka. If it is a Westerner whose palate has been expanded beyond the ubiquitous pizza and cheeseburger, you might also hear borscht. But for those of us enamored of the world of probiotics and the myriad microbes that create such wonders as sauerkraut and kefir, the answer is inevitably kvass. This wondrous drink has a long history among the Russian people. It has been consumed by members of all ranks of society in Russia and the Ukraine for more than a thousand years and is widely considered to be a safer beverage than water. While many ancient cultures solved the issue of contaminated water sources by turning it into alcoholic drinks such as wine or beer, the people of the North instead created a lacto-fermented infusion with miraculous health properties. In addition to quenching one’s thirst, kvass is known to aid digestion, prevent hangovers, and even protect against infectious diseases. Traditionally, kvass is made from stale, sourdough-rye bread. This produces a drink with a taste similar to beer—minus the alcohol content—and with all the health properties listed above. But for those of us who have been forced, by allergies or auto-immune diseases, to eliminate grains from our diet, all is not lost. While rye-bread kvass is certainly the most well known, it is not the only variety available to us. Indeed, Russians have been known to create kvass with all manner of ingredients: from currants and raspberries to lemons and cherries. The most common and perhaps most beneficial alternative, however, is beets. Beets are an amazing super-food with an extensive nutritional arsenal. They are an excellent source of sodium, potassium, magnesium, calcium, iron, phosphorous, vitamins A and C, niacin, and fiber. Their high folic acid and folate content likewise makes them ideal for pregnant women and those who hope to become pregnant. In fact, this humble root-vegetable has been proven to help prevent heart disease, stroke, and even cancer. As with any other fruit or vegetable, the process of lacto-fermentation only increases the nutritional benefits of beets. This traditional method of preservation adds probiotics and allows the nutrients to be more easily absorbed by your body. Since prolonged cooking often destroys, or greatly diminishes, the nutritional content of foods, the fact that your raw beets remain raw throughout the lacto-fermentation process is an added advantage. So, you can imagine what this little medicinal powerhouse is being turned into as it sits there calmly bubbling away in your cupboard. In addition to the pregnancy perks mentioned above, the liver and blood cleansing properties of beet kvass have been known to help prevent morning sickness. Likewise, the crucial role that so many of the beet’s nutrients play in proper cellular function has led to beet kvass being used throughout Europe in the treatment of cancer. All lacto-fermented products gently chelate the body, flushing out heavy metals and toxins, and kvass is no exception. Anecdotal evidence provided by converts to the beet-kvass craze report the beverage as being an excellent remedy for heartburn, chronic fatigue, chemical sensitivities, allergies, kidney stones, and digestive problems. It is also believed to alkalize the blood and improve regularity. For those who are more cosmetically driven, it has actually been reported to diminish age spots. Some have even claimed that after adding beet kvass to their diet, their thinning hair grew back thicker and gray hairs turned darker. I can personally attest to far fewer gray hairs since I began consuming kvass. So, how to create this wondrous beverage? At its most basic, kvass requires only three things: beets, water, and salt. 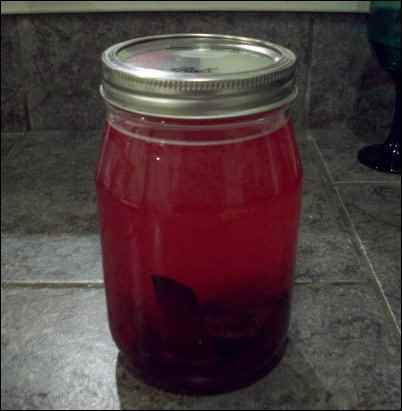 The salt and water create a brine in which the beets pickle. By the end of the process this brine has become kvass, saturated by the beet juice and slightly effervescent from the fermentation action. As with anything, the quality of the ingredients will determine the quality of the final product. The beets themselves are simple enough. Organic is preferred but you can use whatever you have on hand as long as they are fresh. Whether or not you peel them is a matter of preference, though they should be scrubbed clean. Make certain when you prepare the beets that you chop them into one- to two-inch chunks. Do NOT shred them. Beets have a high sugar content and shredding them will release too much of the juice into the brine, creating an alcoholic fermentation instead of lacto-fermentation. Of course, if you think beet wine sounds intriguing feel free to experiment. Your water must be free of chemicals, particularly chlorine. These chemicals are dumped into our tap water for the purpose of killing bacteria. If you put them in your ferment, not only will they prevent any bad bacteria from forming, they will also prevent the growth of any good bacteria and your beets will simply rot. Use filtered or spring water if possible. If all you have available is city tap water, the chlorine can be eliminated by boiling or by leaving the water out in a pitcher overnight so that the chlorine can evaporate. As for the salt, do not use iodized or regular table salt. Use only pure, unrefined sea salt. Any additives can have a detrimental effect on your ferment so be sure to read the label carefully. I have picked up a container of “pure” sea salt before only to discover it contained yellow prussiate of soda (or some other anti-caking agent) and was therefore useless for my ferment. The role of salt in lacto-fermentation is to prevent bad bacteria from forming. However, too much salt can produce an unpalatable drink. To combat this problem, a fourth ingredient can be added to the mix. Simply diminish the amount of salt and add fermented whey to the brine. The whey gives the fermentation process a kick-start, providing the same protection against harmful microorganisms as the salt. The addition of whey is purely a matter of taste, but I highly recommend it. If you decide to use whey, it is easily obtained. All one needs is some plain, homemade kefir or yogurt, and a means of straining it. Store-bought yogurt will work, as well, but you must make sure it is still alive. Although most brands proudly claim the number of live cultures present at manufacture, the process of making the yogurt shelf-stable can often diminish, if not eradicate, those live organisms. Thankfully, it is easy to test whether or not the yogurt you have purchased is still living. Heat one cup of milk on the stove, but do not allow it to boil. Mix into the milk one tablespoon of the yogurt under question. Leave the mixture in a warm place for eight hours or overnight. If the yogurt still contains live cultures the milk will have noticeably thickened. Once you have determined that your yogurt is still full of helpful bacteria, line a colander or strainer with a tea towel or several layers of cheesecloth and set it in a bowl. Choose a bowl that is tall and narrow enough to hold the colander up away from the bottom of the bowl so that your yogurt does not end up sitting in its own whey. Pour your yogurt or kefir into the lined colander and allow it to drain. I usually cover the colander with a small plate and wrap the ends of the towel up over it to keep out any bugs or dust. This also helps keep the ends of the towel from becoming completely saturated with whey and making a mess on my counter. I then place the whole contraption on a second plate to catch any spills. Yes, I end up with more dishes to wash but it keeps everything else from getting sticky, especially if I leave it to drain in my refrigerator. I don’t know about you, but cleaning my fridge is one of my least favorite chores. Cleaning chores aside, you should observe a yellowish liquid dripping out of your colander fairly soon; this is the whey. The length of time you leave the yogurt or kefir to drain is entirely up to you. I will often use the drained yogurt or kefir as a replacement for cream cheese and so my draining time is determined by the texture of cheese I prefer. Eventually of course, if you leave it long enough, all the whey will drain out and you will be left with a dry, crumbly probiotic cheese in your colander which makes a lovely replacement for feta. Depending on the amount of yogurt you start with and how much whey you are hoping to extract, the draining process can take anywhere from a couple hours to two days. Once you have your whey you can begin. Coarsely chop your beets. 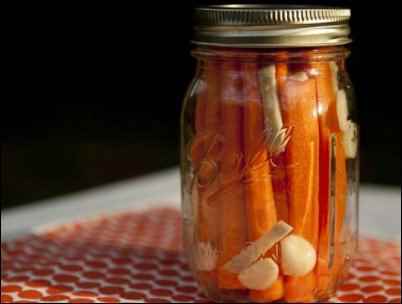 Place them in a clean quart size jar. 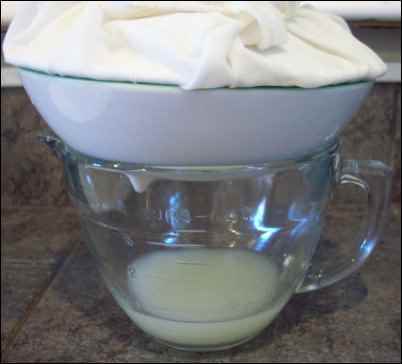 Whisk together the salt and whey with one to two cups filtered water until the salt is mostly dissolved. Pour into the jar with the beets. Add more water as needed to fill the jar within one inch of the top. Cap the jar tightly with a lid—I use metal canning lids with rings—and store at room temperature out of direct light for two to three days. Be certain to check your kvass every day. The fermentation process creates carbonization which may need to be released periodically to keep the contents of the jar from exploding like a shaken can of pop when opened. While the presence of effervescence is a good thing—it is evidence of successful fermentation and provides a lively dimension to your beverage—too much can be messy. Also take the time to taste your kvass. The flavor will continue to develop the longer it ferments. When it reaches a strength that you like, strain the kvass into a clean jar, label and move it to the refrigerator or cold storage. The fermentation process will continue under lower temperatures, but it will be at a greatly reduced rate. Your kvass should keep for several months in the fridge. As for the beets, they can be used for a second and even third batch before you will have to start over with a fresh vegetable. 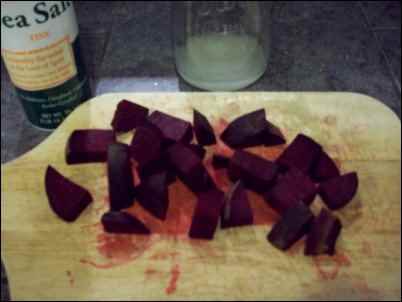 If later batches are not as strong as you’d like, try cutting the chunks of beet in half to release more juice. When you have finished your final batch, do not discard the old beets. Use them to make borscht, add them to a stew, or roast them with other root vegetables. For people who do not care for the taste of beets but still want the health benefits, there are an infinite number of ways you can dress up the basic recipe. Try adding fruit such as fresh squeezed orange juice or chunks of apple. Play with different herbs and spices like lavender or cinnamon. One of my favorite varieties is the addition of carrots and ginger. 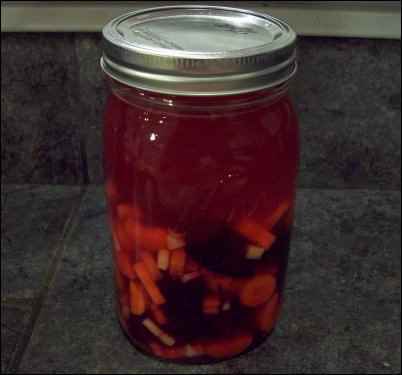 Follow the same method as for the plain kvass, simply adding carrots and ginger to the mix. Please note that for carrots and ginger grating or shredding does not pose the same issue as with the beets. You may however find it difficult to keep the smaller pieces of vegetable under the brine. Complete submersion is important since mold can form on any bits that rise above the surface. Most sources assert that this mold is completely harmless and you can simply scrape off the top layer with no worries as to the safety of the rest of the ferment. I have done this on the rare occasion when I encountered mold and suffered no ill effects whatsoever. However, if you are concerned, discard the whole ferment and start again fresh. In order to avoid the mold question altogether you will need some sort of weight to hold the contents of your ferment under the brine. A well scrubbed and sanitized rock could be used. I sometimes use a whole cabbage leaf, folded over and stuffed into the top. One of the best options though is a small sandwich bag full of water. Make sure to fill it with filtered water in case it leaks. If you find you enjoy beet kvass and want more ways to incorporate it into your diet try adding a splash in soup after it is cooked. Blend it with oil and mustard to make a vinaigrette for your salad. Mix it with fruit juice or add some raw honey and soda water. You can even use it as a brine to pickle hard boiled eggs. Simply peel the eggs, submerge them in the kvass, ferment them at room temperature for two to three days, and then move them to the refrigerator. If probiotics have not been a common part of your diet before now, it is best to start slowly when incorporating beet kvass. The beneficial bacteria in the kvass will immediately go to work flushing toxins and cleaning bad bacteria out of your gut. This of course is wonderful news for your body, but if you drink too much too quickly the overload of released toxins can produce some discomfort such as bloating, constipation, and even minor cold or flu symptoms. Therefore, it is usually best to start out slowly, one to two ounces once a day gradually increasing to a whole eight ounce glass whenever you desire it.